Witnessing a dog calmly give birth is an amazing sight. It sparked a conversation about innate intelligence between Wichita chiropractors Drs. Ryan and Denise Dopps on their Facebook Friday Night Live video (linked at the end of this post). 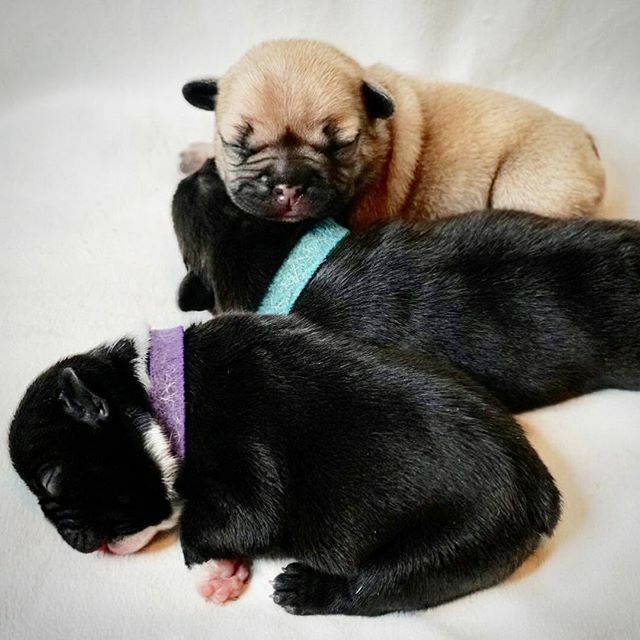 The Dopps’ Frenchton dog, Millie, (half French bulldog, half Boston terrier) recently gave birth to puppies. As Dr. Ryan joked, “I never saw a dog go to a birthing class.” Yet the first-time mama knew what she needed to do thanks to her inborn intelligence, instinct and wisdom. Innate intelligence is responsible for the automatic functions of the body, the heart beating and kidneys filtering blood. Dr. Ryan contrasted this to educated intelligence, our learned skills, such as reading or riding a bike. Dr. Denise gave the example that Millie intuitively knew that she needed to eat more for the puppies’ well-being. She noted that our bodies get goose bumps when we are chilled, without us thinking about it. Innate is synonymous with life. A body may have a brain and spine, but without innate life flowing though the tissues, the body is dead. Understanding the marvelous innate functions of the body can help us to celebrate even symptoms of a cold, said Dr.Ryan. Those symptoms are telling us that our body is thriving and fighting, and notifying us that we need to rest and hydrate to help it. Sadly, we can also make choices that go against what our body innately knows to do, added Dr. Denise, such as ignoring it when it says we need to rest. The result is an unhealthy body. Dr. Ryan told the story of a patient who commented that she had vomited an antibiotic, feeling how strongly her body had known what it needed and rejected the medication. With regular chiropractic care, he explained, a person keeps the interference in their body low, while the body’s communication is higher. Therefore it is able to adapt and communicate better to whatever sickness you may have. “That’s what chiropractic can do, is to release the natural innate processes,” said Dr. Denise. “That’s a chiropractic is,” agreed Dr. Ryan. “The ability to find and detect subluxations and things that interfere with innate processes. It doesn’t cure anything. It’s a method to detect and remove subluxations.” He added that a subluxation (or misaligned vertebra) would be like them intervening in the birth of Millie’s puppies, when she already knew how to do it. Call 316-636-5550 and make an appointment with Dr. Ryan or Dr. Denise at their Wichita office, Dopps Chiropractic NE on Greenwich and 21st. If you are not in the area, contact them for a referral nationwide to another principled chiropractor. You can also find Dr. Ryan on Instagram (@drdopps) where he lives out a chiropractic lifestyle and @letschalkaboutchiropractic posts fun, humorous snippets of information with colorful illustrations.